Tonight I was feeling nostalgic for a comfort food meal from growing up. 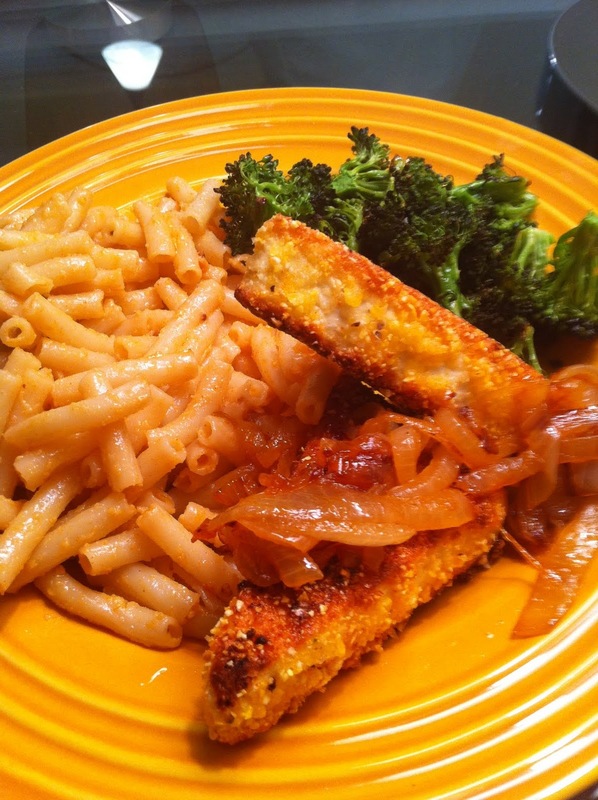 I’ve posted the mac ‘n “cheese” already and the crispy tofu but all together this plate is reminiscent of a regular dinner in our house on Albemarle Road in Cedarhurst. Prepare the “cheese” sauce by combining all ingredients in a little saucepan and whisking over medium heat. It will come together quickly. Take off the heat, let it cool and refrigerate it overnight or for at least a few hours. Take it out when ready to use. Slice up the onion. In a skillet, heat up some oil and add the onions. Season with salt and a lot of paprika. The onions should go until they are caramelized and a little burnt-ish. Cut up the broccoli and place it on a baking sheet. Toss with olive oil and salt. Bake for about 15 minutes or until crispy. Dredge each tofu triangle in the milk, coat it well on all sides, and then dip it into the cornmeal. In another skillet, heat up safflower oil, and fry up the tofu until crispy on both sides. Drain the pasta and add the “cheese” sauce. Mix together and let the heat of the pasta warm the sauce. Everything should be ready at the same time. Plate it up and enjoy!